• Queensland Health has had extensive correspondence with the United Kingdom Organising Committee for the Transplant Games regarding the event. The Organising Committee concluded it would continue with the Games as planned. • [03 August 2009] Prince Charles Hospital reported that the facility had three Extra- Corporeal Membrane Oxygenation (ECMO) stations in operation, all three of which were in use by patients with continned Pandemic (HINI) 2009. • [04 Jul 09] Townsville HSD reported that due to an increase in Pandemic (HINI) 2009 related Emergency Department presentations, an Emergency Department annexe would open to fast track mild cases. • [30 Jul 09] Townsville HSD reported a youth at Cleveland Detention Centre was displaying influenza like symptoms. The inmate was swabbed, isolated and commenced on Tamiflu, with ten further courses of Tamiflu supplied to the Centre’s nurse. Two further suspected cases have been swabbed, administered Tamiflu and isolated. 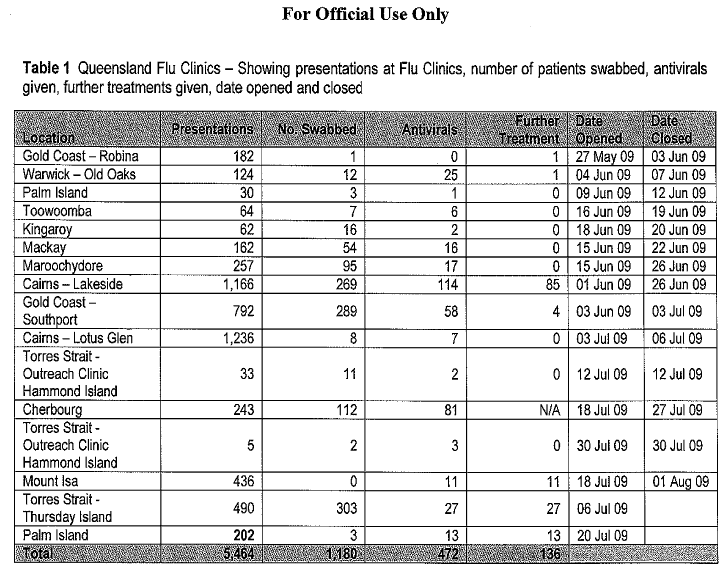 On Tuesday, 04 August 2009, Townsville HSD reported two positive cases of Pandemic (HINI) 2009 at the facility. 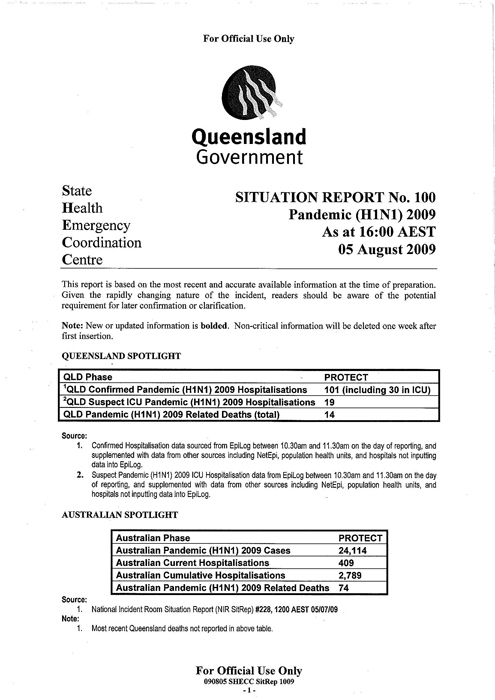 • [03 Aug 09] Central Queensland HSD reported a total of eight continned of Pandemic (HlNI) 2009. • [31 Jul 2009] Longreach has now reported their second continned Pandemic (HINI) 2009 case. The patients are one tourist and one local, and neither have required admission to hospital. • [04 Aug 09] Torres Straight HSD reported that the PNG/Australian border (for the purposes of the Torres Strait – PNG treaty) had been re-opened last Wednesday, 29 July 2009, at 0900 AEST. • [03 Aug 09] Torres Straight HSD reported that a series of public meetings in island communities would soon begin, outlining the importance of hygiene, hand washing and flu infection prevention. • [03 Aug 09] Cape York HSD has assessed data of continned cases and it is apparent that communities in Cape York have community transmission of Pandemic (HINI) 2009. As such all of Cape York HSD moved to PROTECT on Monday, 3 August 2009. On Friday, 31 July 2009, the Cape York HSD advised that the Indigenous Community of Hopevale is moving to the PROTECT phase due to an increase of community transmission of the Pandemic (H1N1) 2009 virus. Where relevant for those communities with low numbers of community transmission, sentinel surveillance mechanisms will continue to be implemented and early treatment instituted, especially for vulnerable groups.